Geraldine is centrally located to many beautiful area attractions. A few are listed below. Please see www.alapark.com for a complete listing of the natural beauty in this area. When visiting our community, you will find plenty of lodging and dining opportunities. ​Many hotels/motels can be found in the nearby cities of Fort Payne, Albertville and Rainsville. High Falls is located approximately 15 minutes from Geraldine and is the closest to Geraldine of all the parks. The center of attraction of High Falls Park is the 35-feet waterfall. 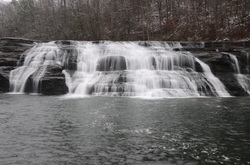 Formed by Town Creek, the falls span some 300 feet across at times. Near the base of the falls is a natural bridge. This 25-feet span of rock features a large arch, eroded by the flow of water over hundreds of years. ​Directions: From Birmingham or Chattanooga, take Interstate 59 to Exit 218 in Fort Payne. Take Highway 35 West to Rainsville, then turn left onto Highway 75. Follow Highway 75 South to Geraldine. At the traffic light in Geraldine, turn onto Highway 227 North, and follow the signs to High Falls Park. 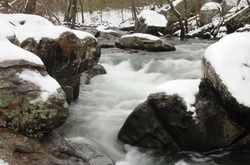 Buck's Pocket is a beautiful 2000 acre state park with a variety of things to do. Enjoy modern or primitive campsites, fishing, picnic areas, pavilions, hiking trails, or just enjoy the mountain scenery from the point rock overlook. It is located two miles north of Grove Oak, Alabama. This park is located approximately 20 minutes from Geraldine. ​ Hours of Operation: 7 a.m. until sundown. 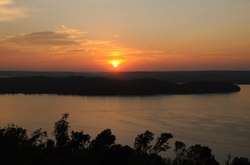 Lake Guntersville is located in the Tennessee Valley approximately 20 minutes from Geraldine. The park has over 6,000 acres of natural woodlands and has a majestic 69,000 acre reservoir. The park includes an 18-hole championship golf course, a camp ground, beach complex, fishing, hiking trails, nature programs, zip-line and many other exciting activities. Located at the top of the park is the beautiful Guntersville Lodge, which includes hotel rooms, a restaurant, cabins and is a beautiful venue for conferences, weddings and gatherings.